This one may be a big miss for most collectors. 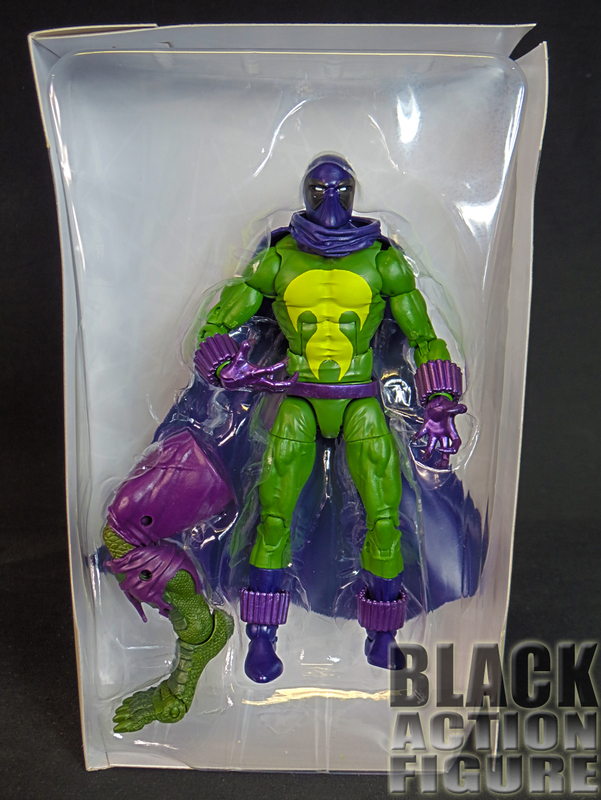 For one thing, most collectors won’t even know who this character is…even though he’s been around since 1969. 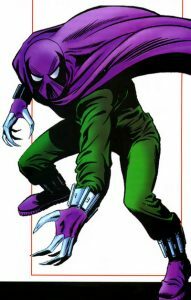 Although several people have worn this costume, the Prowler is at most times known to be Hobie Brown, small-time criminal turned later into a sometimes anti-hero. Why now? 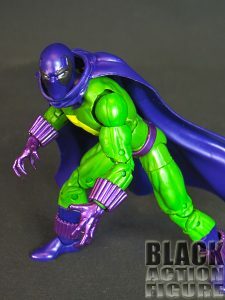 The Prowler, while showing up in various incarnations throughout the comic books and Spider-Man animated series, the character will next show up in the upcoming animated Spider-Man movie, “Spider-Man: Into the Spider-Verse”. I thought now would be a good time to introduce this character to the masses. 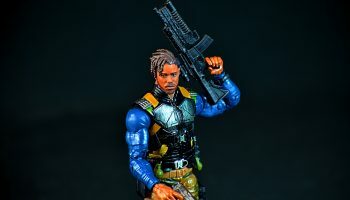 I have been reading about this character in the comic books for years, and although he plays a minor role in the whole of Marvel Universe, you can almost feel how this character’s design has influenced other comic book characters including Spawn and Deadpool. 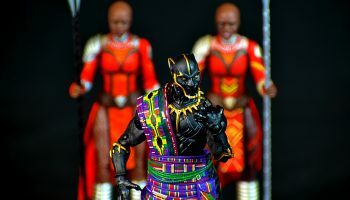 Does the figure live up to the character’s nearly 50 years of existence? Let’s check out the review. Nothing new here….except…looking through the window, my eye catches the amount of white space showing. I can instantly tell that this figure is bound to disappoint me in the accessories section, and the glaring white just makes it all that much obvious…and for that, the score is losing half a point from where I usually grade it. Otherwise, no new territory here. The side illustrations are forgettable. The package looks nearly interchangeable from previous Marvel Legends Spider-Man waves. The back of the packaging is nicely laid out, but it mostly always looks nice. Whew, y’all know I feel like going off, right? 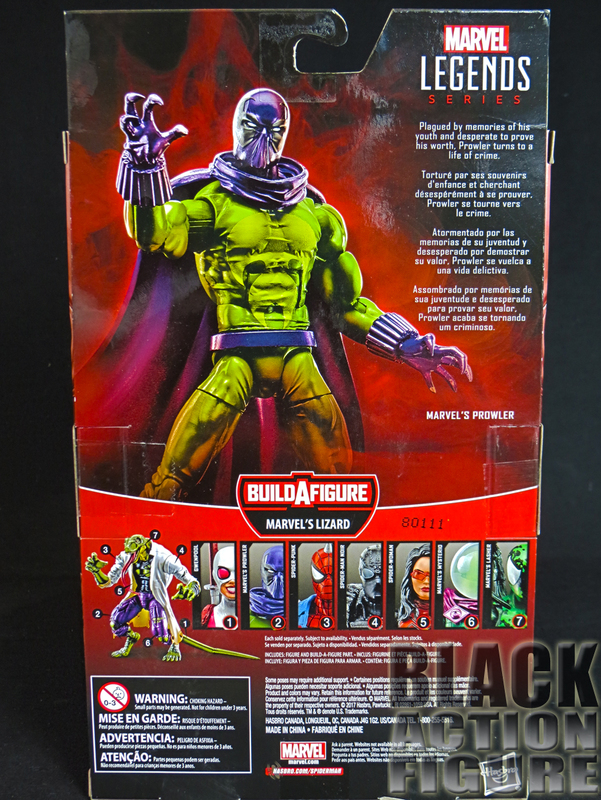 No damn accessories which is why all you’re seeing is the Build-A-Figure piece, Lizard’s leg. Absolutely nothing beyond that. What could they have gone with? Nearly anything else. They could have included an extra pair of hands, maybe closed fists. The character is a gadgets wizard, so they could have included some of his known gadgets. The characters wrist armaments are used to deploy gas and darts, so making that accessory to attach to his wrist wouldn’t have been hard at all. And why the hell can’t we have a separate head? 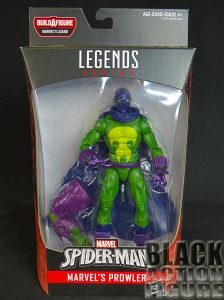 Do we not want the reveal of this nearly 50 year old character to be (*gasp*) Black? An extra head would have been nice. 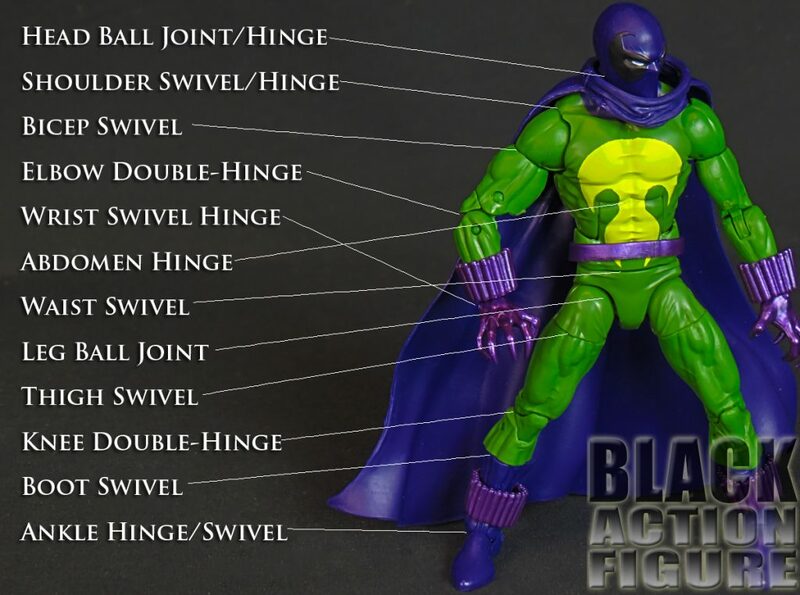 This figure almost makes up for these misgivings in the articulation section. But we’re not there yet and I feel very offended that they felt no need to provide us with any accessories. As far as general likeness of the sculpting goes, Hasbro got it right. 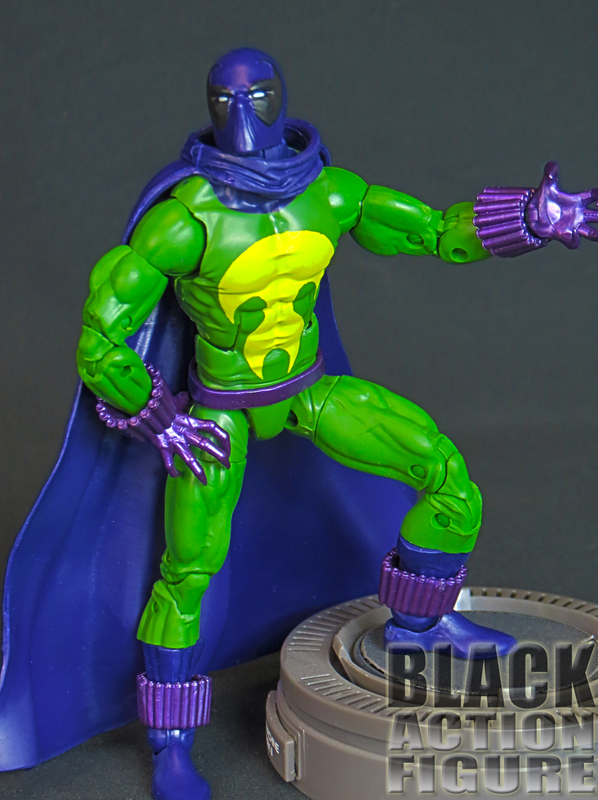 It’s a solid looking figure in the sculpt department, although it really wasn’t complicated due to the rather simplistic design of the character. Unfortunately, this figure has two major problems. 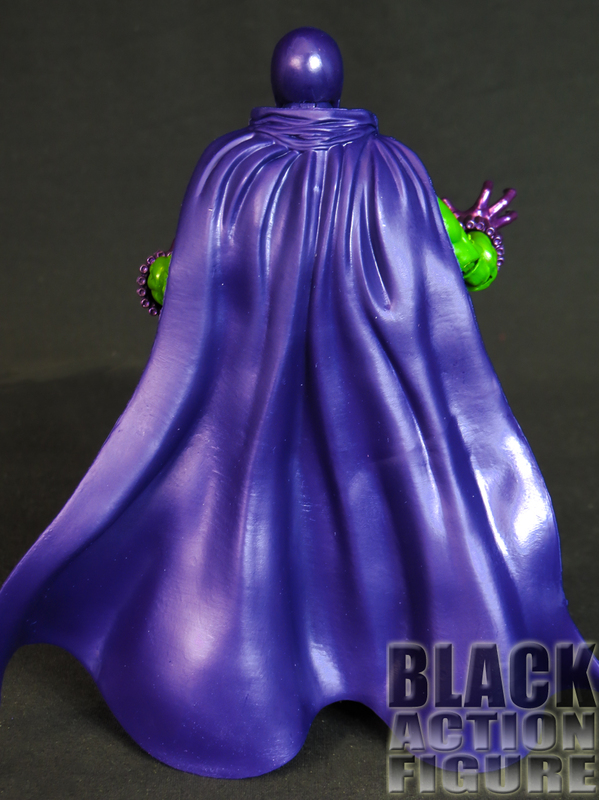 The first problem are the costume decorations, including the wrist and leg armaments and the cape. The wrist and leg armaments keep sliding from their intended position. Seriously, a dab of glue would have been nice. The cape is a whole other animal. 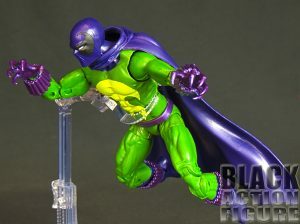 Being loose as it is, it hangs off of the figure in weird angles and hinders head/neck movement. It even caused the whole head to pop off if it is pulled back too far. The second problem comes from the paint choices. 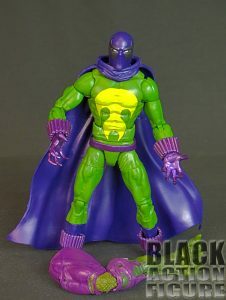 First let me say, I’m tired of Marvel and the Purple & Green characters…I think some time in the past, Marvel had a deal with their art supplies retailer and all they could afford was Purple & Green pens, pencils and paints. We have the hulk in these colors, the aforementioned Lizard in these colors, the Green Goblin, Kang, the Skrulls…the list goes on and on. At any rate, you can notice from the pictures that there are actually two versions of purple being used. 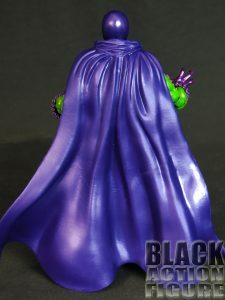 The cowl and cape along with the boots are purple more towards the blue spectrum. The figure’s gauntlets and “leg warmers” (j/k) are colored purple more towards the red spectrum. 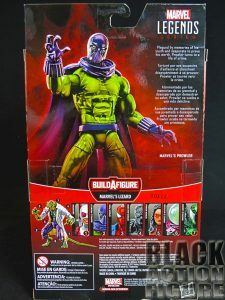 Get your colors together Hasbro! I really have no complaints here (outside of a few minor ones) since this figure comes with the standard Marvel Legends articulation, which amounts to about 32+ points. 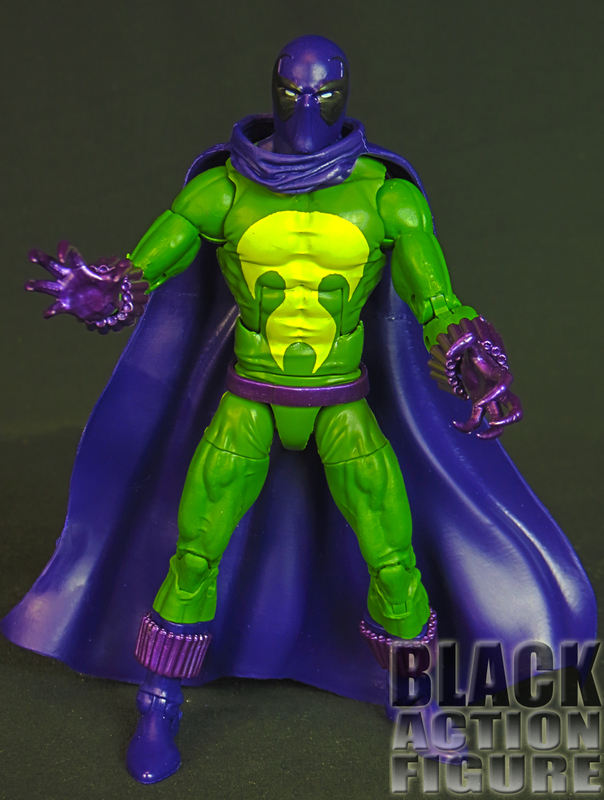 Things that bothered me included the head which kept popping off due to the cape (instead of the articulation itself). And the falling armaments on the figures wrists and ankles made this figure kind of awkward to work with and pose. But generally a good session. Some of the joints were stiff and needed some flexing to get them to move. 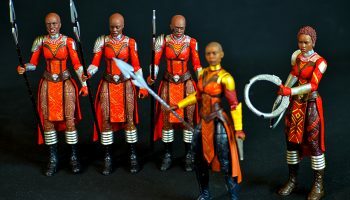 I’ve been disappointed lately with figures that I look forward to opening only to find that some nagging issue has ruined the enjoyment of said figure. All that and the fact that I have to explain this character every time someone comes into my man cave makes it almost not worth putting it out there. I’m hoping once the character becomes more mainstream, we may even see more of him. I actually have the “Into the Spider-Verse” version of the figure that I hope to review soon.